Police think the driver may have been impaired in this 3/12/2019 morning incident. Also, for some reason they are protecting the identity of the suspect. Maybe will be non-traffic? (for now it’s tagged). A Phoenix homeowner received a rude awakening Tuesday morning after a car crashed into one of the rooms of their house. 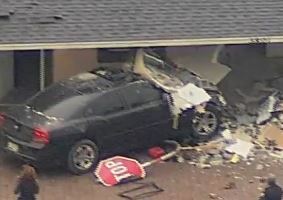 The crash happened around 7 a.m. at a house on 38th Avenue, Phoenix Police Sgt. Tommy Thompson said in an email.